Phyisicists created atom-thin sheets of silicon - and named the new material Silicene. The idea to create such sheets from Silicon emerged in 2007 - even though silicon doesn't naturally form the required atomic bonds. 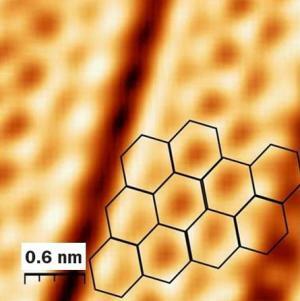 Silicene has a similar pattern to Graphene and possibly has the same electronic properties and might have advantages of Graphene because silicon is more integrateable into today's electronic devices. The Silicene was created by growing a thin layer of silicon on top of a ceramic material called zirconium diboride. X-rays shined on this thin layer of silicon revealed a honeycomb of hexagons similar to the structure of graphene.